Using spinal models provided by Dr. Kiyokawa of Tokyo, Japan, I’d like to show you how misalignment of the head and neck can be the cause of pain, discomfort, stiffness, and limited motion in the rest of the spine. 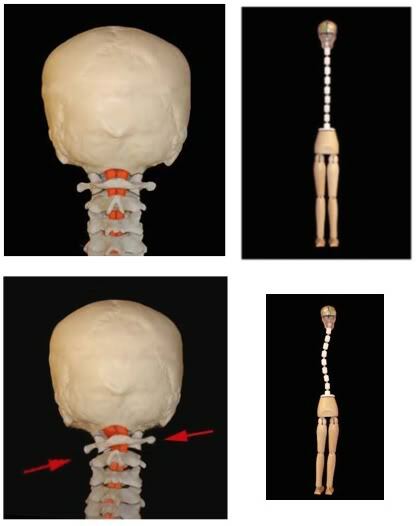 The top two photos depict what your head looks like when it is balanced over the neck and shoulders. As long as the head/neck are properly aligned, the rest of the spine is better able to perform its duties of protection, stability and support. The two bottom photos show the opposite. The red arrows demonstrate a tilting effect of atlas, or C1. This tilt causes the head to be lower on the left. As a result, a cascade of neurological and mechanical reflexes take place to level the head. The rest of the spine will now have to bend, curve, and twist in subtle ways to compensate for the misalignment of the head/neck above. These compensatory shifts within the spine are often the primary motivator for people to seek chiropractic care. But just because they have pain between the shoulder blades, in the lower back, or even down in the hips/knees, it doesn’t necessarily mean that they need “treatment” applied directly to these areas. The pain sensations are effects, and every effect has a cause. Head/neck misalignment can induce all sorts of different symptoms. Sure, you can find a doctor to treat the knee… another doctor to treat the shoulder… and plenty of doctors to treat low back pain. But many times, these measures fail to offer long-term results. They might push the “pause” button for a few days or weeks, but the pain returns, over and over again. Upper Cervical Care strives to correct the cause. It has been the key for many people seeking a solution to their own health problems. And this is what the masses need to see/hear – nice job, Doctor Tanase!! I’m shooting this over to some folks tonight. This is wonderful! My friend January Harshe sent your site to me, her husband Brandon Harshe is an UC Chiro in Dallas. She has been trying to convince me why UC is so important. Not that I thought she was wrong, I just never had it explained quite like this. My husband has two degenerated discs in his lower back and NOTHING the conventional doctors do seem to help it. I tried to get him to talk to Brandon when they came to visit us back in June, but he just wouldn’t do it. I think once he reads this, he may be more convinced. I’ve also been suffering with migraines since I was 17. 14 yrs is a long time to put up with headaches. I thought I had them under control when I discovered I had a condition called PCOS and I got it under control. However, I am on day #6 with a headache. I think I will be making a call to my regular chiro and then making the 6 hr drive to see Brandon once he gets his practice up and going at the end of the month. Thanks again for the info! Keep spreading the good word! Drug Ads: Didactic or Deceptive?